It’s the iPod accessory with the fewest features, but probably the most anticipated one: the SendStation Dock Extender. Tired of constantly peeling your iPod from its case to use your docking station or iPod speaker system? Does attaching dock-mounted accessories like a voice recorder make you speechless? Thanks to the Dock Extender, that’s all a thing of the past. Plug & play finally is back! No matter what case you own, SendStation’s Dock Extender has been designed to fit it. 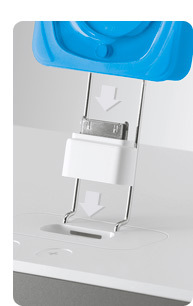 Your Dock Extender uses the same compact iPod plug as found on the standard iPod docking cable from Apple, so it’s compatible with all cases that have a dock connector opening. Your Dock Extender comes equipped with a matching Universal Dock insert  with a removable support and three interchangeable bumper caps. It’s like a good friend, one you can lean on: All iPods in all cases are welcome to take a break and recharge. (All 30 pins are passed through, so any other iPod feature works too, of course). By popular demand Dock Extender is now also available in black color. It also includes a Universal Dock insert , which of course perfectly matches your black iPod speaker system and docking station. A healthy Apple  whether it’s an iPod or iPhone  shouldn't be peeled. Get your SendStation Dock Extender now. *) Dock Extender does NOT fit Otterbox Defender for iPhone 3G/3GS (yet fits perfectly the Defender for iPhone 4), Apple Bumper case and Element Case’s Vapor for iPhone 4, but can be easily fitted. See FAQs for details. 1. The Universal Dock standard was introduced by Apple in 2005. Since then iPods with 30-pin dock connector have been shipped with a matching Universal Dock insert, a white plastic part which fits into the docking cavity of those docking stations and speaker systems for the iPod, which are built to Apple’s Universal Dock standard. This standard can only be found on officially licensed, “Made for iPod” or “Works with iPhone” badged accessories, though it’s not mandatory. The SendStation Dock Extender includes a Universal Dock insert, which follows the exact same standard. Unfortunately this product has reached the end-of-life status and is no longer available for purchase. "...a must have if you hate removing your iPod case..."
"...a clever answer to a common problem. 5/5 mooses." 2. Dock Extender works flawlessly with any iPhone, but does not fully fit into the Apple iPhone Dock and Apple iPhone Dual Dock. Apple’s Universal Dock (MB125G/C) is recommended instead. Share this site with a colleague or friend who’d be interested in SendStation’s iPod Dock Extension solution.